Media photographers were given access to roughly the first 30 minutes of practice today. As you can see, not much other than some walk-through drills and stretching were going on. What...you thought they'd let us diagram plays or something? As a blogger, and a photographer, I'll take what few precious moments inside the walls of Fort Schembechler I can get. • For those looking for #27 Derrick Green in these photos, he's not. • Devin looked to be warming up with #61 Graham Glasgow. • Of course Lewan was looking as huge as ever, although he's leaner than before. 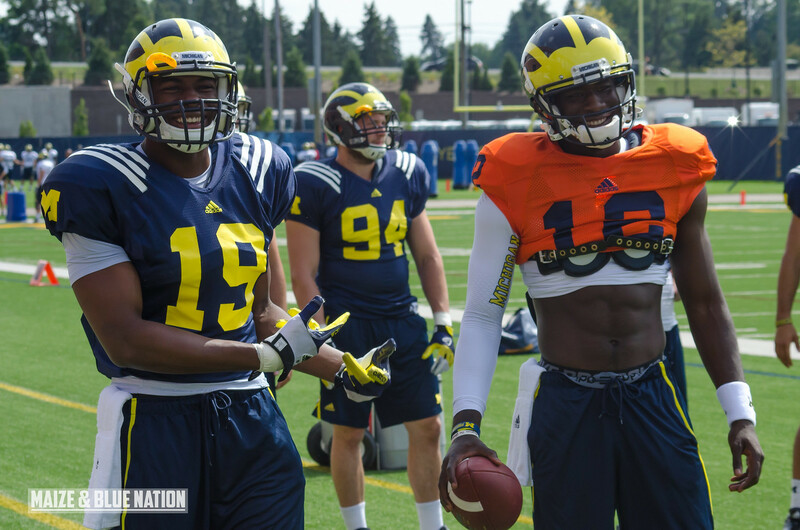 • Funchess looked like he put on some bulk. • #43 Chris Wormley has added quite a bit of size as well. • Jake Ryan was out there, but I never saw him do anything besides stretch. • Blake Countess and Fitz look to be 100%, or close enough to not notice. Overall, I say the atmosphere around the practice field was very energetic and upbeat. Not that I have a ton of other Michigan practices to compare it to, but I get the sense that practices under Hoke and his staff are pretty quickly paced. Only 22 days to go!